As the 2016 presidential election kicks into high gear, the attacks against Donald Trump and Hillary Clinton seem to be intensifying. Everyday we heard things that suggest Donald Trump is a racist and a bigot and is totally unqualified to serve in office. Others say that Hillary Clinton is a liar and a crook and that she’d be in jail if not for her political connections. Although some people might decry this overly negative campaigning, unfortunately it is the way politics has been trending for quite some time. For example, when I started out in the mid 90s, I was taught by folks on both sides of the aisle that Republicans shouldn’t associate with Democrats and vice versa. Adherents to the other political party were stupid, not to be trusted, and often just plain evil. One should never treat one’s opponent with civility if it can be helped, because they certainly wouldn’t offer you that same level of respect. Unfortunately, this problem has gotten even worse. Toward these same lines, we’ve had a preview of this year’s horribly negative campaigning before, right here in Virginia in the 2013 race for governor. The Ken Cuccinelli campaign branded Terry McAuliffe as a corrupt businessman who was totally unqualified to serve in any office, let alone governor, while the McAuliffe folks painted Cuccinelli as a right-wing zealot who wished to turn back the clock on the rights of many individuals. Both sides went heavily negative and although there were positive selling points for both men, these topics were generally forgotten as both campaigns tried to portray the other as an absolutely horrible outcome. During the campaign, I spoke with some Cuccinelli staffers who actually declared that their primary goal was to expose McAuliffe in the worst possible light so that by Labor Day most Virginians would consider him completely unelectable. From what I witnessed, I suspect the McAuliffe folks decided to employ a similar strategy of demonization against Cuccinelli. They both framed the campaign as the choice of the lesser of two evils and voters were urged to vote against either McAuliffe or Cuccinelli rather than feeling positive about either. As a result, many of my Republican friends then and now still refer to our governor as Terry McAwful. However, in that ugly morass was a third candidate, Robert Sarvis. Although the powers that be conspired to keep him off the debate stage, he still managed to capture 6.5% of the vote from Libertarians and those who were sick of the race to the bottom campaigns of both the Republicans and Democrats. And here we are again in 2016. We have a Republican and a Democratic candidate who both suffer from exceedingly high negatives. Unfortunately, many polls indicate that the average American views Trump and Clinton in an unfavorable light. Odds are, if the Republicans or Democrats nominated a candidate that was at least halfway likable, he or she would be enjoying a huge lead over his or her primary opponent. The problem is that negative campaigning does work…at least to a point, provided that there are no other candidates in the race. In November many Republicans and conservatives will hold their noses and vote for a deplorable man like Donald Trump if they are convinced that they have no other choices and that he is the only way they can stop their greater foe, Hillary. Likewise, many progressives and Greens despise Hillary Clinton for being corrupt and loath the revelation that Debbie Wasserman-Schultz and the Democratic National Committee rigged the primaries against Bernie Sanders. However, if the don’t support Clinton how else can they stop a thug like Trump? Well, fortunately voters do have other options as there are two (or possibly three) other candidates who could garner enough electoral votes to win the election. They are: Gary Johnson of the Libertarian Party, Dr. Jill Stein of the Green Party, and potentially Darrell Castle of the Constitution Party (although working toward it, he has not reached the ballot access threshold yet). I remain fully convinced that if the United States were like every other democratic nation, which offers voters a variety of choices and not simply only two (or often one) candidates, this era of increasingly negative campaigning would be drastically curtailed. After all, if two candidates or their campaigns decide to make it their primary mission to prove that the other is wholly unsuitable for office, then voters could choose a third option and reject the campaign of fear and hatred that both of his or her opponents offer. If a third party candidate could win a major election from time to time, campaigns would soon come to the realization that they would actually have to sell their own candidates and promote their own supposed principles, rather than presenting themselves as the better of two horrible options. Maybe then we could get candidates that we actually like, ones that can be trusted to uphold some kind of values, and perhaps party platforms would be more than lofty ideals that are often ignored or even repudiated by their own candidates. Now, wouldn’t that be something!? When you read a piece written on one of the multitude of blogs out there, do you ever stop to think about the author? For example, do you ask what motivated him or her to craft the article and what agenda he or she is trying to advance? Yes, when it comes to politics there are conservative blogs, liberal blogs, blogs that promote a grassroots or anti-establishment point of view, and those who seek to prop up certain elected politicians. Last weekend I took a good bit of time to ponder this thought. Several months ago a candidate contacted me as he was considering hiring me for his campaign. After several abortive attempts I finally I spoke with his campaign manager just recently. Although I was told that they didn’t have the funds to make an offer at this time, I was informed that I could help them out by writing pieces on this website critical of their opponent. It was hinted that doing so might improve my chances of future employment. However, the more I thought about the matter, the more it disturbed me. One of my primary motivations in writing The Virginia Conservative is to report on political events around the state (especially in the Shenandoah Valley), offer my thoughts about politicians, their staffers, and legislation, and do my small part to promote political dialogue as well as the ideals of liberty and limited government. The pieces I’ve written here I do so because I think they are important, because there is some matter that ought to be brought to public attention. Have my opinions shifted and changed with time and new information? Of course! If you scroll back, you can find writings from 2008. Who can honestly say that he or she has remained completely the same in an eight-year period? However, no one has ever paid me to write anything that you find on this website and all thoughts presented (unless otherwise indicated) are my own at the time that they were written. I was later informed that this situation arose out of a misunderstanding. But it did get me thinking. Is this idea foreign to many political blogs? Are they merely fronts for various organizations, candidates, and politicians, willing to write whatever makes their clients look good (or calls their enemies into question)? Let me expand on what I wrote concerning the Stimpson campaign. Back in 2013 the Susan Stimpson campaign for lieutenant governor contacted me prior to the Virginia Republican Convention. One of her staffers wanted me to write a piece critical of both Jeannemarie Davis and Pete Snyder, two of Stimpson’s opponents that year. As such, they provided me with information and quotes from a gathering elsewhere in the state. I did not personally attend this event, so the only material I had to work from was the information provided from the Stimpson campaign. First of all, I wasn’t all that enthusiastic to attack either Davis or Snyder. Both Jeannemarie Davis and Pete Snyder had taken time out of their campaign schedule to meet with me personally. Although the Stimpson campaign repeatedly suggested a similar face-to-face meeting, they never made good on this promise. However, in the interest of promoting dialogue, I agreed to write up a piece using the material that they sent me provided that I could mention that I had received this information from the Stimpson campaign. However, they didn’t want their opponents to know that their campaign was behind it and so declined. As a result, I decided not to run the story. So are bloggers seen as mere mercenaries for hire these days? Given some of the seemingly baseless attacks from one of the larger Virginia blogs against a certain legislator, I sometimes have to wonder. Much like super PACs, do politicians and groups funnel money to bloggers to anonymously attack their foes? Has that become our reputation? If so, I would be ashamed to call myself a blogger. I would not want to associate with any writer or campaign that thinks that this kind of behavior is okay. Yes, I do have an agenda to promote dialogue and liberty, but I feel if others discovered that I were writing thinly veiled behind the scenes attacks (paid or even unpaid), it would completely obliterate my credibility and any chance of even an attempt at objectivity. Perhaps I am wrong. After all, donations are few and far between and the costs of running The Virginia Conservative are higher than the monetary gains. Nevertheless, I hope my readers can rest assured that when they read an article on this site, it isn’t written because I am getting paid to promote a certain cause or candidate. I do it because I’m one of those people who believe in what they say and think that honor is worth more that the lure of a possible job. Revisiting 2013 once more, I’d like to believe that Ms. Davis and Mr. Snyder approached me because they considered me to be fair and objective, focusing on the issues we have in common, and not simply as someone who can be bought off to support a certain point of view. So, what do you see as the reputation of bloggers? Here in Virginia, the race for our next attorney general is unresolved. In the days after the election, the totals fluctuated for the candidates with each enjoying the lead at some point. When the state board of elections certified the official result on November 25th, Democrat Mark Herring led Republican Mark Obenshain by 165 votes out of over two million cast. As a result, the Obenshain campaign has asked for a recount, which is permitted in races where the percentage difference is one percent or less and paid for by the state in cases where the margin is less than 1/2 of a percent. Will the recount change the outcome? The last statewide recount took place in the 2005 attorney general’s race. Republican Bob McDonnell led before the recount and emerged victorious afterward. According to a press release sent out from the Obenshain campaign on Tuesday, “There have been four statewide elections in the U.S. since 2000 that finished within a 300 vote margin. In three of those four statewide elections the results were reversed in a recount.” Yes, it is possible the outcome could change; Virginia taxpayers shouldn’t grumble about footing this bill. As we await news of this recount, if Obenshain should fall short some Republican activists have been promoting the idea of something called a “contest”. In close elections where there are cases of massive voting irregularities, candidates can appeal to the General Assembly to decide the outcome. The last time a contest took place was in the late 70’s when a Republican candidate contested the result of the election. Perhaps not surprisingly, the then Democratic-controlled General Assembly decided in favor of the Democratic candidate. However, as the Republicans control a significant majority of seats in that body, if asked to settle a contest today, presumably they would divide along party lines with Obenshain emerging as the victor. Although a contest could allow the GOP to salvage some small measure of victory in an otherwise poor election year, without considerable proof of fraud or error, such a move would heavily tarnish any semblance of free and fair elections in Virginia. Like the troubling decision to allow control of the lieutenant governor’s office to decide the power structure of the Virginia Senate in cases of a tie, I worry that there are elements within the Republican Party which would be willing to take this any methods necessary approach to thwart the will of the voters in the race for attorney general. “A real conservative would not damage a pillar of the American political tradition by disrespecting the voice of the people expressed through voting. It is at the heart of American democracy, because it is the means by which we confer power in an orderly and peaceful way. Although Andy and I disagree on a multitude of issues, I really hope he is right on this point. Republican friends, I’m sure that I’d like see Senator Obenshain as our next attorney general as much as any of you. But absent of proof of fraud, don’t lobby your legislators to overturn the November elections through a contest. Sure, doing so may result in a short-term victory. But the long-term consequences could be devastating. The ends don’t justify the means. Let’s let the recount and the voters determine the outcome, not 140 legislators in Richmond. Well, ladies and gentlemen, it has been nearly a week since the election of November 5th. Perhaps it is time for a little analysis. Before I begin, I should add that the week before the election, Bearing Drift asked their readers to offer their predictions on how things would turn out. Therefore, in each race, I’ll start by mentioning my predictions. The four November polls in the lead up to Election Day predicted Cuccinelli down by significant percentages, 12%, 7%, 6%, and 7%. Only one, Emerson College placed him within two points and the margin of error. As Cuccinelli had not been leading in a poll since mid July, the general thought was that it wasn’t going to be a particularly close race. However, the Cuccinelli campaign tried two tactics right before judgment day. The first involved Obamacare. Given that citizens across the country were having tremendous difficulty signing up on the official website, this frustration and anger proved to be fertile ground for the Cuccinelli camp given that Cuccinelli had been attacking the program within hours of its passage. If the Cuccinelli campaign had latched onto this message sooner rather than relentlessly attacking McAuliffe, then perhaps they would have stood a good chance of actually winning. Second, as negativity was their style, the Cuccinelli campaign and their allies attempted last minute smearing of Robert Sarvis, declaring that he was not a real libertarian and that he was secretly funded by Democrats. Although neither of these claims were grounded in much fact, as they were distributed by both leaders in the liberty movement and a handful of well-known media sources, some voters accepted them as true and passed them on to their friends and neighbors unquestioned. Although these tactics likely enraged a number of Sarvis supporters and turned them further from Cuccinelli, it did drive others to switch their votes from Sarvis to Cuccinelli. Although I predicted that Sarvis would pull equally from both McAuliffe and Cuccinelli, exit polls show that either his presence didn’t affect the overall outcome or he drew more from the Democratic side than the Republican. However, this last ditch effort to win Sarvis support likely caused an even deeper fracture within the liberty movement in Virginia. 10% was the hurdle that Sarvis needed to reach and, as I predicted, he fell short. However, assuming these false attacks were not launched, it would have been interesting to see how close he would have come. If you account for rounding, I hit this one exactly on the mark. Unfortunately, as I stated upon the conclusion of the 2013 Virginia Republican Convention, by nominating Jackson the Republicans had surrendered the LG race. If you will recall, in Jackson’s previous attempt at a statewide race the year before, he picked up a scant 4.72%. Although Jackson strongly resonated with the hard-line social conservatives within the GOP, many of his previous statements regarding alternate religions and lifestyles hurt him tremendously among average Virginians. Although Ralph Northam did not run a particularly impressive or vigorous campaign, all he needed to do was to air some of Jackson’s more controversial statements and victory was all but a certainty. The Obenshain/Herring contest turned out to be a real nail-biter, with the results still unknown and likely headed to a recount. Originally, I expected Obenshain to win based upon the fact that the Democrats had not won the attorney general’s spot since 1989 and that Obenshain had been working hard to capture this office for the last several years. Although, in my opinion, the Obenshain team ran the best of the three Republican campaigns, they were no doubt hampered by troubles at the top of the ticket. Once news of a possible recount emerged, I was still under the impression that Obenshain would win, but with the addition of “missing” ballots from Fairfax, the results seem a lot more unclear. We likely won’t know anything definitive for at least a month. With all of the excitement surrounding the three statewide races, the hundred seats in the House of Delegates weren’t much more than an afterthought for many Virginia voters. Although I didn’t know where, I assumed that the Democrats would pick off a Republican somewhere. It looks as if the GOP lost in the 2nd district, picked up the previously Republican leaning independent seat in the 19th, picked up the vacant seat in the 78th, picked up the vacant seat in 84th, and lost the 93rd. Elsewhere, there were a considerable number of close contests. Prior to the elections and vacancies, the Democrats had 32 seats. Now they have 33. Although I’ve written extensively on the 93rd in previous posts, it seems that even with a bit of gerrymandering the seat was too difficult for the GOP to hold for long. So I guess the question now is, will Obenshain win? And, especially if he does not, given their string of successive statewide losses since the 2009 election, what will become of the Republican Party of Virginia? 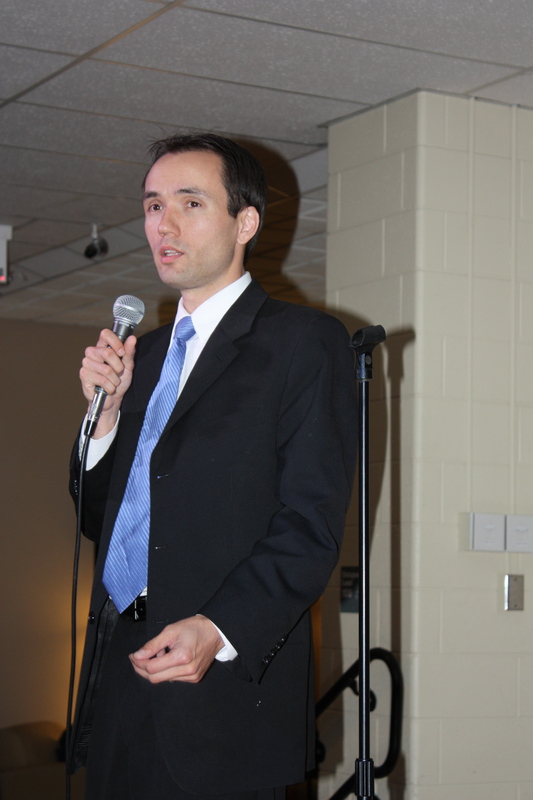 This weekend, Libertarian gubernatorial candidate Robert Sarvis offered his thoughts and thanks to his staff, volunteers, and supporters. Although, as Sarvis pointed out in his letter, in the early stages some activists declared that the Sarvis vote total would amount to very little, he managed to make waves by capturing a much higher percentage than any previous statewide Libertarian candidate. Also, I appreciated the fact that the Sarvis campaign was issue driven, remaining remarkably positive in one of the ugliest brawls between the Republican and Democratic candidates that I had ever witnessed. The efforts of the Libertarian stood in stark contrast, which likely improved his standing among disgusted and disillusioned voters. Yes, it is tempting, especially for those limited government conservatives, to wish failure upon our new governor. After all, most of us did not vote for him. However, Sarvis gets it right when he declares, “as I said in my Election Night speech, we must do our duty to support him [McAuliffe] as our Governor to move public policy in the right direction. We should rally behind him when he is doing what we agree is right, and we must be constructive in our criticism when we believe his actions or decisions are ill-advised.” At the end of the day, we must remember that we are all Virginians, first and foremost. Lastly, I must say that I appreciated being recognized by Mr. Sarvis alongside so many good liberty-minded folks across our great state. It was an interesting adventure and I look forward to hearing what the future has in store for Robert Sarvis. If you didn’t click on the link above, you can find the full text of Robert Sarvis’ letter here. Hello readers and greetings from Chesterfield County. On most Election Days, I’m out working the polls and collecting data, but today you can find me in the former headquarters of the Jamie Radtke for Senate campaign working for my former employers from 2012. Anyway, I’m sure that many of you are busy either at the polls, making phone calls, or even going door-to-door. Not only is turnout in this race is important, but which parts of the state are turning out better than others will have a critical impact. Remember as you look at turnout numbers, Democrats want higher numbers in northern Virginia and most cities (excluding Virgina Beach), while rural areas like the Shenandoah Valley are Republican strongholds. Where are areas of Libertarian strength? I guess we’ll have to wait and see. While driving on I-64, this morning, I received two phone calls on the same topic. I’m sure you know that I’m disappointed to read about this latest attack on Robert Sarvis. The latest claim, for those who haven’t heard, is that he is somehow a plant funded by the Democrats. Although I don’t dispute that the Libertarian Super PAC has donated to Sarvis and that one of their donors may have given to Democratic candidates, to make the wild leap that Sarvis doesn’t believe in a libertarian message or is merely a stooge of the McAuliffe campaign is rather absurd. Some points to ponder: the Libertarian Super PAC also donated to Gary Johnson when he ran for president in 2012. Does that fact make him a plant too? If Sarvis is a plant, why wouldn’t they be giving him a lot more than $11,500? After all, a statewide campaign requires massive amounts of money. And why would the PAC bother spreading their resources, giving the Libertarian candidates for House of Delegates anything if Sarvis was their ace in the hole? Come on people, I know it can be difficult, but try and think rationally. 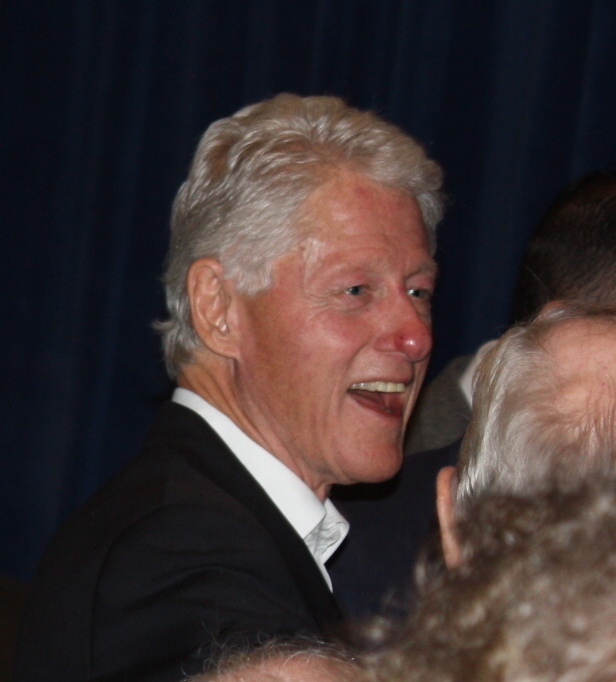 A Libertarian group donates to a Libertarian candidate…ohh, the scandal! What a waste of electronic ink. Haven’t we learned yet that Ken Cuccinelli cannot win merely by attacking his opponents? If you want Ken to win, promote Ken. Must this lesson be learned the hard way? Anyway, if you haven’t voted, go out and make your voice heard. What’s the Liberty Vote Tuesday? Guest post by Charles Frohman. A Virginia libertarian can vote Tuesday for Attorney General Cuccinelli and feel comfortable, despite his unwillingness to contemplate removal of government from women’s health care, private behavior, gun purchases or immigration. That’s because the “Cooch” – as some in politics call the Republican candidate for governor – will focus on the changes needed in the state for progress: cuts in government taxation, cuts in bureaucratic spending and cuts in job-stifling regulations. Certainly McAuliffe, the Democrat, offers no reason for a vote, given his “government-first” answers for any Virginia problem. What about the third choice, Libertarian Sarvis? Doesn’t he offer an investment for Virginia’s long-term future that combines the fiscal responsibility of the Cooch without the social interventions saddling the AG? Yes, only Sarvis offers the combination of fiscal responsibility and social tolerance favored by most Americans; if ten percent of voters Tuesday invest in the Libertarian, that party will have no signature threshold to get onto future state-wide ballots through the next several elections – guaranteeing a libertarian choice and, perhaps most importantly, pressure on the Republicans to stop offering candidates that are only partially acceptable, as the Cooch is only acceptable fiscally. Conservatives may have noticed the GOP smears against Sarvis floating around the interwebs over the past week. They claim Sarvis isn’t as libertarian as the Cooch on spending, healthcare reform or transportation funding. These distortions of the Libertarian’s record have properly been debunked by the Richmond Times Dispatch, Virginia Conservative and Virginia Right – all faithful conservative media organs and none in the pocket of Sarvis. The truth on taxes is that while the Cooch helpfully would marginally cut income taxes, Sarvis would seek abolition of the hated tax and move to a consumption tax (making us competitive with the growing number of states that rely for revenue solely on a sales tax). Let’s abolish the income tax. On taxpayer-funded health care for the poor, Sarvis never said he disagreed with Cuccinelli on holding the line on expanding Medicaid –the core access expansion provision of ObamaCare. Sarvis, however, has called for reform of government health care, moving to a cash-support model (touted famously in 2012 by Congressman Paul Ryan) whereby the poor could receive a voucher to buy any health plan instead of having a one-size-fits-all plan shoved onto them. Further, only Sarvis wants to get government out of women’s health care; Cuccinelli doesn’t. Libertarians – and Sarvis – want government out of health care period. On Transportation funding, Sarvis is accused of supporting a privacy-violating mileage tax to fund road building. The Libertarian does not endorse this tax and instead merely included it in a list of suggested ways to undo the damage done by Cuccinelli’s administration that moved away from user fees. Further, only Sarvis has mentioned the libertarian dream of devolving road building decisions to local governments away from Richmond. Local control is the way to fix those potholes and build more lanes to get rid of congestion. Staying on the privacy-threatening implications of the car mileage tax, it’s striking that the Republicans making this warning fail to see the way Cuccinelli already has violated this warning with his support for mental health gun bans. For the government to deny 2nd Amendment rights to mental patients, the government must violate health privacy. And who doesn’t suspect the definition of mental disability will expand as the government tries to deny more Americans – including civil dissidents – this ancient right of armed defense? The 2nd amendment is not to be trifled with. The Cooch deserves a vote Tuesday for his generic fiscal conservatism and judicial activism against ObamaCare, Real ID and those unfairly prosecuted. However, to keep the pressure on Virginia to keep moving in a libertarian direction – including to protect the gun rights of all Americans, to get government completely out of healthcare, to get government out of private behavior and to improve transportation with more local control – withhold support for un-libertarian choices and invest in an “open-minded and open for business” future for Virginia with a vote for Sarvis. Charles Frohman, from Suffolk and now in Williamsburg, worked in DC politics for 2 decades including Governor Gary Johnson’s 2012 presidential campaign. He now directs development for the Our America Initiative, the only national grassroots movement for fiscally responsible activists who also are socially open-minded. To reach Charles, email CFroh@yahoo.com. For those who are unaware, until recently Donna Holt served as the Virginia director of Campaign for Liberty. During her time in this position, she often promoted awareness of U.N. Agenda 21, an objective which some believe is an effort to erode American sovereignty and severely restrict land use in this country. As we are just days from the election, with Sarvis’ poll numbers hovering around 10% (most a bit higher, some a bit lower), many of my liberty-minded friends have been taking to Facebook to talk about Robert Sarvis. Some offer legitimate concerns, while (as far as I can tell) a majority seek only to deride Robert Sarvis as a person as well as to cast doubt on his principles, integrity, and commitment to liberty. Favorite tactics these days include calling him nothing more than a McAuliffe operative (there’s a conspiracy theory for you), or that he is some kind of LINO (a word I think must have been invented for this campaign, Libertarian In Name Only). In order to further these tactics, they take bits and pieces of Sarvis’ quotes out of context and use them as proof that he is secretly supporting some kind of statist agenda. Now, I know why many of my friends are proceeding down this path. They are worried that Sarvis will peel away a significant number of liberty-minded voters that may have otherwise gone to Ken Cuccinelli and thus cost him the election. However, many polls show that idea to be false. For example, according to the Richmond Times Dispatch, “Sarvis is getting 3 percent of the GOP vote, 2 percent of the Democratic vote and 14 percent of independent voters.” In the September Roanoke College Poll, they found that Sarvis draws upon 4% of Democrats and 3% of Republicans. With these statistics (and there are more out there), one could hardly make the claim that Sarvis will deprive Cuccinelli of a victory. Furthermore, many of my brothers and sisters in liberty have bought into the idea that a Terry McAuliffe election will spell the end to everything we hope to achieve in Virginia. Now, given my research, I don’t find McAuliffe to be a particularly appealing candidate. At this point, he doesn’t seem to have much knowledge about the function of state government nor its proper role. Nevertheless, when we let fear cloud our judgment, we often find ourselves in even worse messes. As an additional note, I must say that I don’t appreciate that some people continue to argue that Robert Sarvis made no attempt to reach out to the liberty movement or Ron Paul supporters. After all, here I am. I try to avoid self-aggrandizement, but I have been active in the liberty movement for years and proudly worked for Ron Paul in 2007/08. However, I’m sure many of you have also gotten a handful of emails that distort Robert Sarvis’ positions or claim that polls indicate his support slipping, even though the three latest polls (Rasmussen, CNU, and Emerson) show him in double digits. Yes, Jamie Radtke, Donna Holt, Chris Stearns, and Russ Moulton are important folks, but that doesn’t mean that we should assume that every email bearing any or all their names is factually correct or that they or anyone else can speak for the liberty movement as a whole in Virginia. Getting back to the whole tweet issue mentioned at the beginning, it clearly is an ill-advised retaliation by a member of the Sarvis campaign team, but the constant and often misleading attacks on Robert Sarvis are equally ill-advised. I encourage you to weigh your options carefully and vote on November 5th for whom you think is the best candidate. Although I’ve had disagreements with the RLC-VA this year, as Robert Kenyon, the chairman of that group said yesterday, “I’m going to humbly suggest that, while I fervently believe pro-liberty voters in the Old Dominion should support Ken Cuccinelli for Governor, the best way to convince people is NOT to accuse Rob Sarvis of being some sort of crypto-liberal or hating puppies. Talk about why Ken is our guy.” The Sarvis supporters ought to follow this line of thinking as well. If you truly want liberty in Virginia, whether you are for Cuccinelli or Sarvis, please stay positive ladies and gents. Promote your candidate and don’t simply malign the others. After all, regardless of this election, on November 6th we have to try and come together as a movement. Spending the next several days tearing us apart over fear and misinformation will make that task all the more difficult. As Virginia approaches its November 5th election, activists are pondering all sorts of questions. 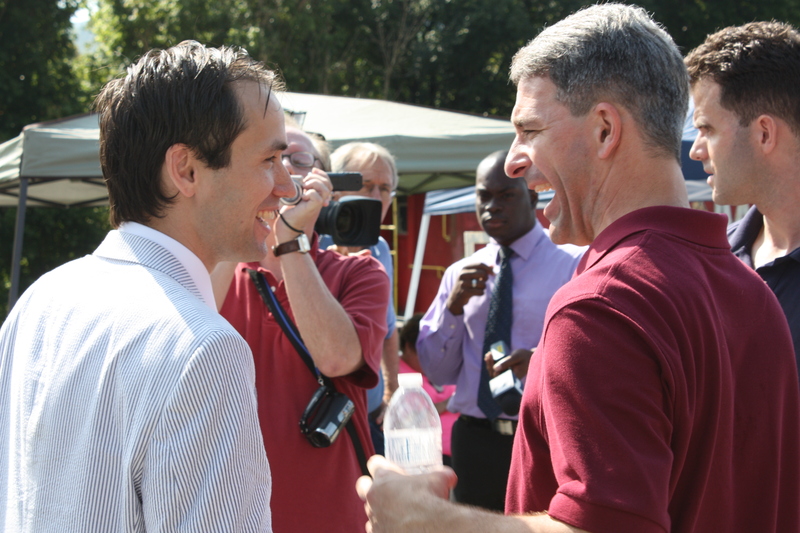 Will Ken Cuccinelli launch a surprise comeback to become the state’s next governor? Will the Democratic Party sweep the three statewide offices for the first time since 1989? Will Mark Obenshain win the attorney general’s race, proving to be the one bright spot for the Republican Party on Election Day? However, one question that will also have a lasting impact on Virginia politics is, will Robert Sarvis meet or exceed the 10% mark? For some, this last question might sound a bit odd. Isn’t who wins or loses the election the only important factor? What difference does it make if Sarvis gets 1%, 5%, 10%, or even 15%? Well, if Robert Sarvis captures at least 10% of the vote, that means that Virginia would now have three major recognized political parties, the Democrats, Republicans, and the Libertarians. For the Libertarians, this switch would mean easier ballot access. 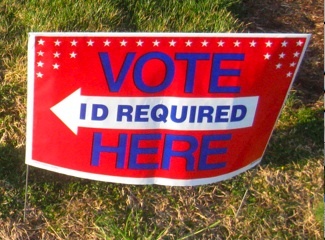 For example, although the Libertarians nominated Sarvis by convention in April (similar to how the Republican nominated Cuccinelli in May), the Libertarians were under the additional burden of being required to collect at least 10,000 signatures from registered voters to actually get Sarvis on November’s ballot. For a smaller party, like the Libertarians, this effort meant considerable manpower and funding. If Sarvis gets 10% or more, should the Libertarians nominate a candidate via convention for the 2014 Senate race, they would be free from this task, at least for the next several years. With these thoughts in mind, will Sarvis make 10%? Recent polls indicate that he could, but many activists are skeptical. That being said, fellow blogger Shaun Kenney of Bearing Drift stated today on Facebook that Sarvis will reach the 10% threshold. Anyone else care to offer their predictions? This morning, around a thousand individuals gathered at the Festival Center on the campus of James Madison University. I arrived a little after 8:30 AM for an event which was slated to begin at 10:30 and already the line stretched around the building. Along with fellow blogger Nick Farrar, we checked in at the press table and awaited the start of the rally. 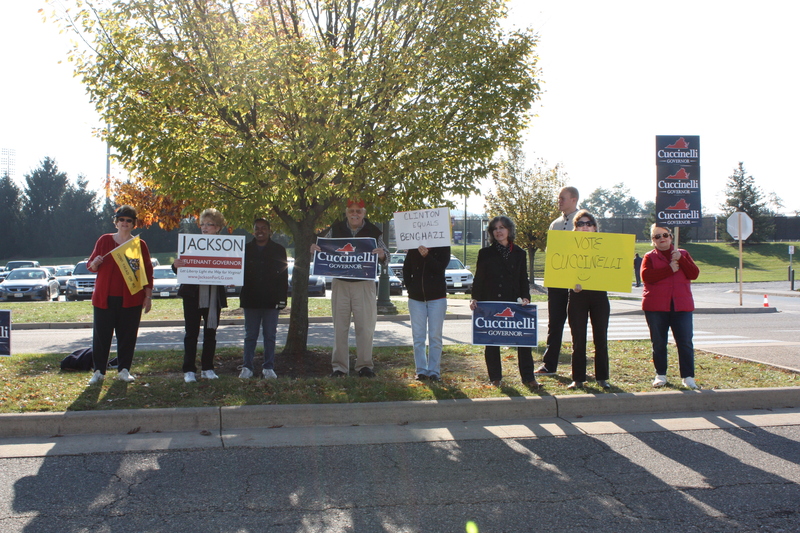 About an hour later, a group of nine gathered outside to show their support for the Cuccinelli campaign while another local activist drove his truck down the street with signs of the three Republican candidates. It seemed that just about everyone who was anyone in local Democratic politics attended, including past mayors and party leaders. About a third of the seats in the room were reserved for them. Given that seats were at a premium, a vast majority of the crowd had to stand. To the best of my knowledge, this event was the largest, and thus arguably most important political event in Harrisonburg since candidate Obama spoke at JMU in 2008. Does this event herald a victory for McAuliffe in Harrisonburg and statewide? We’ll find out in a week.